More dangers are coming to the Sea of Thieves... and with them, more opportunities for crews who have no concept of fear and a hankering for hard-won spoils! As revealed in our Content Plans announcement shortly after launch, The Hungering Deep will kick off a run of free Sea of Thieves content updates throughout the year. Last week offered the first real hints at what might be surfacing in that update. In a trailer that gave the spotlight to Merrick – survivor of some salty escapades himself – a stream of tales, claims and cave paintings stirred up glimpses of what's coming on May 29th. A new and not inconsiderable threat to seafarers will be joined by a raft of other additions, including a voyage of discovery upon which you'll cross paths with Merrick himself. 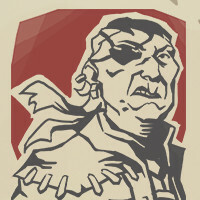 More details will be appearing here on the site soon to whet your appetite, and there may already be some connected developments scattered among the community-driven stories in issue 1 of the Pirate Times.